On Monday, October 24, the Unit for Criticism and Interpretive Theory hosted “The Innovation Conspiracy: Ruin and Rebirth in The American University,” a lecture by Christopher Newfield, professor of English at the University of California at Santa Barbara. Below is a post he has provided for the Campus Faculty Association Blog. His official blog can be found here. 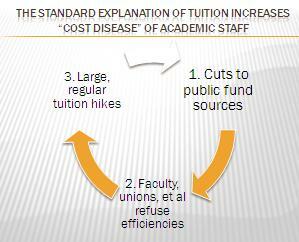 Public universities are being endangered by a false consensus about their problems and solutions. The consensus puts every academic activity in an austerity box, which makes it much harder for universities to imagine the educational upgrade our society and economy need. I’ll offer two examples, and the first occurred last week in the Levis Faculty Center on the UI –Urbana campus. My comment here is not about what actually happened in the room. It is about the story arc that was pieced together by a reporter – I assume with impressive professional skill –from statements that seem to have been made. On October 25th, the News-Gazette published an article about a faculty meeting with the new University of Illinois system president Michael Hogan. One goal was to discuss Hogan’s centralization plan, which would among other things create a single admissions system for the University’s three very different campuses – Urbana-Champaign, a mature and internationally distinguished public research university, Chicago, an important urban campus, and a regional campus at Springfield. It appeared that the enrollment centralization plan had not yet been presented to the chancellor of the Urbana campus or to faculty representatives. Faculty were worried that the plan was a done deal already decided by the new president and the Board of Trustees. The possible implications were clear: a major point of authority would be taken away from the campuses. Perhaps the Urban-Champaign campus would be leveled down by administrative means. According to the story, when faculty expressed concerns about this lack of consultation, president Hogan asked if they wanted to go back to the days when UI was under investigation for corrupt admissions practices. He noted that state law “makes it perfectly clear the university is a single, common entity with a single seal, single president… single budget,” although, he conceded, the system has three “somewhat distinct campuses.” He added, “The president is the president.” When UI history professor Mark Steinberg told Hogan, “there’s a growing worry this is a board of trustees we have no influence over,” Hogan replied that the board is “incomparably better than its predecessors” and that they are engaging more with faculty than before. Hogan’s position appeared to be that the faculty had nothing to complain about, and that concerns about consultation could be laid to rest by invoking presidential authority. The article does not mention anyone who described the practice and principles of shared governance at the University of Illinois. Nor does the article mention anyone that, on the question of academic programs, noted high rates of existing campus innovation or who called on the president and the Board to support upgrading educational quality. Here we have a missing narrative, one that explains what has actually been going on in universities. Faculty and staff struggle in a time of cuts to maintain quality, and students struggle to learn in larger classes with less help. Tuition goes up as public funding goes down, and yet, in this accurate story, faculty, staff, and students continue to innovate and try to upgrade with decreasing help from political, business, and academic leaders. The News-Gazette article instead provided a familiar script. The presidential figure, Michael Hogan, affirms a constitutional basis for a unitary executive, places faculty outside of that, defines the era uniquely as a time of cuts, suggests that faculty had not sufficiently adapted to this plain reality, and defines their role as cutting their own programs. The narrative does not err by raising the issue of program changes, which would normally include elimination and consolidation. The problem is the false tale through which these changes are presented. Here the executive is the bulwark against people who deny fiscal reality. 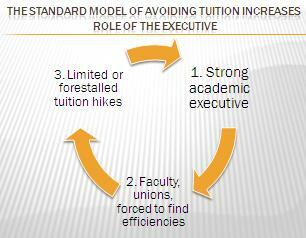 Full governing partnership with the faculty would implicitly jeopardize this. The News-Gazette article exists in ecology of such articles. The national discourse is the fuzzy sum of these inputs. As it happens, the next day the Los Angeles Times covered the new College Board report on tuition increases, where other standard elements were introduced. The headline was “California leads nation in escalation of college costs.” The piece began, “Steep funding cuts to higher education in California and elsewhere were significant factors in pushing average tuition and fees up 8.3% at four-year public colleges and universities nationwide this fall.” The causal claim here was explicit: states cut funding, and then universities raise tuition. This article offers an operative back-story that animates the conflict in the News Gazette narrative without being present in it. 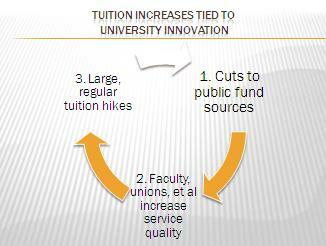 The claim is that faculty and staff not only do not innovate but are opposed to innovation. Sadly, the innovations they oppose, according to this tale, are exactly the ones that would save money while at the same time, through higher teaching loads, help students. This narrative offers the back-story that explains why public universities now require the strong executive that Michael Hogan came to UI to be. • Everyone agrees that higher education is a private good. • As a result public funding is never coming back. • Therefore we must give up on that and orient public universities toward downsized programs, relentless cost cutting, and higher tuition. • Faculty and staff will resist all of these, so a university’s senior managers must be given the authority to impose efficiencies. • These efficiencies must be enforced through productivity assessment, including bibliometric analytics for faculty promotions, educational efficiency as measured by degree throughput, and other Taylorist practices. • None of this hurts educational quality, which will instead improve through tougher management. These elements form a vicious narrative cycle, and for decades it has had the real-world effect of reducing resources for public education relative to the private elites (p 237). Faculty members need to redouble their efforts to fix this narrative, for the sake of research and teaching alike.